The MEN’S COLLEGE BASKETBALL App from DIRECTV! Get ready for the big dance with the MEN’S COLLEGE BASKETBALL app from DIRECTV! 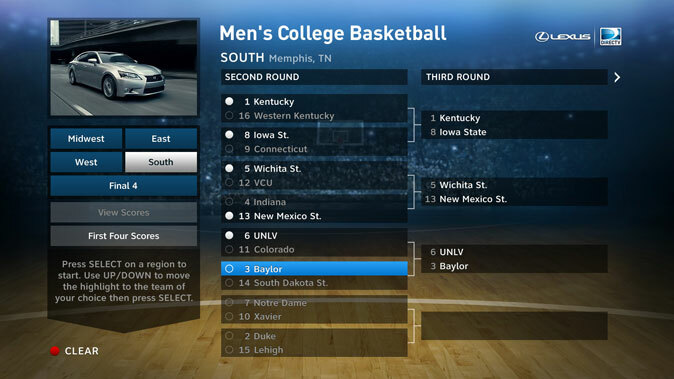 You’ll be able to select your picks for every game this tournament so you can follow your bracket right on your TV. As games are played, the app will automatically display your correct or incorrect picks with the final scores. To access the app simply tune to ch. 701 or hit the right arrow on your remote if your set-top-box is broadband connected. • After selecting a region, press SELECT after highlighting the team you want as your pick. Move to the right to advance to the next round. • Before you can select your picks for the FINAL 4, you need to complete all your picks for the prior rounds. • You can change your picks at any time until you select “Confirm”. • You can also select “First Four Scores” to see the scores for all the first round games. • Even if you miss the first few days of the tournament, you can enter picks for games that were already played. • To see how well you did in particular games, select a region. • For quick updates on your totals, check the instructional area on the left to see the number of correct picks and total number of games. • You can select “View Scores” to see the actual tournament bracket and game scores. Don’t forget to catch all of the tournament action on your local CBS station, TNT (ch. 245), TBS (ch. 247), TruTV (ch. 248) and SPORTSMIX (ch. 205). JustCLICK HEREto make sure you never miss a moment on DIRECTV. For a complete schedule of the games as well as updated bracket, visit CBS.com. Good luck with your picks and enjoy!